Pro Tools systems, by standard, offer four recording types including Normal (Nondestructive), Destructive, Loop, and QuickPunch, if you are fortunate enough to own either a HD system or a Pro Tools system with the Complete Production Toolkit installed, you will also benefit from a further two recording modes in the form of TrackPunch and DestructivePunch. This tutorial will take you through the various modes as well as touching on a few recording options you have when working with MIDI as well. By default, Pro Tools system will resort to the Nondestructive recording mode until changed, so let’s start by looking at how we can change which mode is currently operational. There are various ways in which you can select a recording mode, firstly you can choose one from the Options menu as shown in the image below. Another method available to change your recording mode is to right-click the record button located on your transport bar and select one of the options. Quick Tip: You can bring up the transport window from the Window menu, or by using the shortcut Command_Numeric1 (Mac) or Start_Numeric1 (Windows). Now that we know how to switch between various recording modes, let’s take a look at the differences between them. As you have probably already deciphered, Nondestructive mode or ‘Normal’ mode as it is commonly reffered to within Pro Tools, records in a nondestructive manor, this means that no existing material is erased or destroyed, even if it is recorded over. If you do find yourself recording over existing material then Pro Tools will simply place the latest recording on top but keep both as separate audio clips for you to move freely and edit etc. The area in which audio is recorded depends on where your recording markers are set within the edit window as shown in the image below. If you have not placed the recording markers, recording will simply commence from the current location of the cursor and will continue to do so until you until you hit the stop button of the transport window or hit the spacebar which has the same effect. If you have sufficient storage capabilities then nondestructive is most definitely more favourable over destructive modes as it ensures you should never accidently record over a sufficient take you may have captured previously. Quick Tip: Within all nondestructive recording modes you can stop the current recording and disregard the information by using the shortcut Command_Period (Mac) Start_Period (Windows). Destructive mode is generally favoured by those who may not have sufficient storage space on their computer to have the luxury of storing each and every take. When using destructive record mode, any existing material which is recorded over will simply be lost and will in no way be able to be recovered, this means that even the undo command will render useless, so use with caution! Quick Tip: When recording in Destructive mode, the waveform overview of the clip will not be displayed until recording has stopped. In terms of where the recording starts and stops, this mode works in exactly the same way as the previously mentioned nondestructive mode in that if markers are set then recording will occur between them, or if not, recording will begin at the playback cursor and continue until stopped. You should also be aware that destructive recording is not supported with rendered AudioSuite clips with handles, should you want to use destructive mode in this situation then you will need to consolidate these clips. Loop record mode allows you to record over and over again between recording markers in a nondestructive manor, providing your selection is at least one second in length. This mode is particularly useful when you want to continuously record a specfic section of your production without losing momentum which often occurs when having to setup and start recording over and over again. When using Loop record mode, each recording ‘loop’ is stored as an individual clip which is numbered sequentially as you continue to record, this means that they can easily be distinguished from one another for use when you have finished tracking. Like various other recording modes, while recording, the waveform overview will not become visible until you have stopped recording. QuickPunch mode allows you, at the touch of a button, to instantly either start or stop nondestructive recording while playback continues regardless. 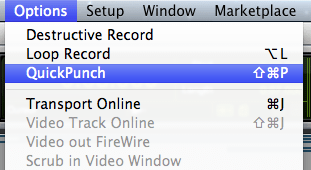 While in QuickPunch mode, Pro Tools will create a new file as soon as playback begins in which clips are automatically generated at each punch in/out point, each of these individual clips as well as a complete file are then availble for use from the clip list on the right hand side of the edit window. You may also be interested to know that up to 200 of these ‘punches’ can be captured in a single motion. This is a particularly useful record mode when you wish to record very small sections within a large playback area without racking up lots of storage space with unwanted material. The way in which it functions is very clever giving you lots of options after you have recorded to edit as you wish, without the fear of having recorded over something else during the process. TrackPunch mode is only available on HD Pro Tools systems, or systems which have the Complete Production Toolkit installed. It works in pretty much the same way as QuickPunch, as soon as you begin playback Pro Tools automatically starts capturing a whole file, as well as storing each of the individual clips which you choose to ‘punch in’ and record as we described in the previous section. The difference with this mode is that you have the ability to record enable/disable tracks while playback or recording is occuring without causing any interruptions, a handy feature which unfortunately is not available on non-HD systems, or systems which do not have the Complete Production Toolkit installed. Just like TrackPunch mode, this option is only available within HD systems or systems which have the additional Complete Production Toolkit available. DestructivePunch mode functions in the exact same way as QuickPunch mode with the difference being that recording is destructive, this means that should you ‘punch’ record over existing material, it will be erased and lost. This mode, as with any destructive mode, should be used with a fair amount of caution to save yourself from accidently deleting something you wanted to keep. As we have said over and over, if you have sufficient storage space on your system, play it safe and use a nondestrcutive record mode. While we are discussing the different record modes available within Pro Tools I thought it would be a good time to quickly touch on some options you have when recording MIDI data into your sessions as well. As we have discussed, with audio, it is the record mode which determines whether newly recorded material replaces existing material or is joined with it, when working with MIDI things are a little different. MIDI recording within Pro Tools holds a feature known as ‘merge’, when merge is active newly recorded material is added to, or ‘merged’ with the existing data, this is particularly handy when you are loop recording and want to build up a drum beat by playing in one piece of the kit at a time for example. When MIDI merge is inactive, existing material will be removed as it is recorded over, this may perhaps be useful when you are unhappy with a take and simply want to record another take over the top of it without wanting to keep any of the original data. So now we know what the merge feature is, let’s take a quick look at how we turn it on and off. You will notice that on the end of the transport bar are your MIDI controls as shown below. If you can’t see these options on your transport bar then you will need to add them by simply clicking on the small drop down arrow in the top right corner of the transport bar and select ‘MIDI Controls’ as shown in the image below. You should notice a small icon which looks like a horizontal arrow with an arrow coming in above it, this is the merge control, when the background is grey merge is unactive and when it is blue, merge is active. So a pretty lengthy article, but hopefully one you have found beneficial. Record modes take seconds to switch between but can save you a great amount of work when you have tight production time. If you have found this article helpful then please do leave a comment below or say hello on Twitter! I have subscription for protools 12,just to learn how it works. When I try to record its not working.What setup should i use in order r to enable recording. I’ve set everything up (focusrite forte+PT11 both newest drivers). record button flashes, but soon as i press space bar, all stop/play/record come on, then instantly all go out. it will not record anything. i know the sound is getting to protools, as i can see spikes in incoming and outgoing signal when i tap the mics. any ideas? thanks for any help. That sounds like a strange one, firstly have you tried closing the session and Pro Tools completely and reloading it? After that try changing your hardware buffer to something else, play then stop the session and then return the hardware buffer to it’s original value, this has solved a problem similar in the past, if not perhaps try posting in our new forum and seeing if anyone else has had anything similar? My record button disappeared can you help me? Hi Eduardo, thanks for getting in touch, do you mean the record button has been grayed out or that you can’t see it at all? Where abouts within the window has it disappeared from?